Get inspired by Sicily's mix of historic treasures and natural beauty! Explore outstanding Taormina and its famous Greco-Roman Theater. Enjoy a cable car ride to the beach as well as a boat tour of the Mazzaro Bay and the Ionian Coast, during which you see beautiful caves like the Grotta Azzurra. Rise to Mount Etna and have a day trip to Syracuse to see Neapolis Park and discover Ortygia island. Welcome to Catania - an ancient port city on Sicily's east coast. Upon arrival, you are met by your private driver at the airport, who transfers you to your hotel in Taormina for the check-in. In the morning after breakfast at your hotel meet your private local guide. Together you take off to see the highlights of Taormina. After touring the old town of Taormina you take a cable car down to the beach for your private boat ride. During the boat tour of the Mazzaro Bay and the Ionian Coast you discover the beautiful caves including the Grotta Azzurra and the nature reserve Isola Bella. During the boat ride you may bathe in the clear blue waters of the Ionian Sea. After the tour you return to the hotel. You have rest of the day free to enjoy Taormina on your own, spend time on the beach or dine in one of local restaurants overlooking the bay. Following breakfast your private driver meets you at your hotel and takes you on an unforgettable road-trip to Sicily's main attraction - Mount Etna, the highest volcano in Europe*. *Note: If you wish, we can arrange an optional Catania city tour along the way for you. Your driver takes you to an access point - the Rifugio Sapienza on the southern slope located 2,000 meters (6562 feet) above sea level. Here you take a walk to visit the "Silvestri" craters and the latest new lava flows and craters from 2001-2003 and enjoy the desert moon atmosphere! If you wish to go higher up Europe's largest volcano you can purchase tickets to the cable car on the spot at your own expense. Once your visit to Etna is over, you are transferred to your hotel in Taormina and have rest of the day at leisure. Today is reserved for you to explore and enjoy Taormina on your own or to join our carefully planned optional tour. Following breakfast your private driver meets you at your hotel and takes you on a journey towards Syracuse. The highlight of the day is a guided visit to one of the most important archeological sites in the World, the Neapolis Park of Syracuse. You start your sightseeing program by visiting the archeological area of Syracuse and explore the still-working Greek Theater, the Ear of Dionysius and the Roman Amphitheater. After your visit, proceed to the delightful Ortygia Island - the heart of the historical baroque city. Walk with your local guide along the ancient narrow streets, which still keep the medieval influence. The highlights of Syracuse is a visit of the Duomo di Siracusa and Chiesa di Santa Lucia alla Badia church with the original “Caravaggio” painting inside. 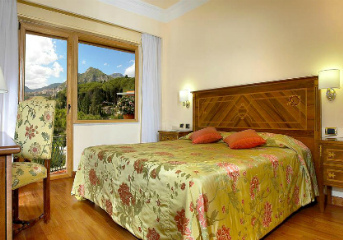 After the tour you return to your hotel in Taormina and rest of the evening is at your own leisure. Set off on a full day tour to see the sites of used in "The Godfather" movie with Al Pacino. Relaxed pace staying all nigths in one city with sufficient time to immerse yourself in the local culture.